Roof Bars & Roof Racks. Wheel Locks, Spacers & Fixings. ABS Pump & Sensor Rings. Brake Pad Set - Parking Brake. Brake Shoe Kits & Fittings. Fan Drive Belt Guides & Pulley. Fan Drive Belts & Kits. Timing Belt Guide & Pulley. Timing Belt Kit Inc Water Pump. Guide Tubes & Quadrant Kits. Combined Master & Slave Cyl. Master / Slave Cylinder Kits. DMF's & Clutch Package Kits. Wing Mirrors, Covers & Glass. Crankshaft Gears & Gasket Sets. Exhaust Valve & Inlet Valves. Sump Gaskets, Plugs & Seals. Fuel & Engine Management Parts. Anti Roll Bar Bushes & Links. Ball Joints & Fitting Kits. Control Arms / Wishbone Bushes. Track Rod Assemblys & Ends. CV Boots & CV Joints. 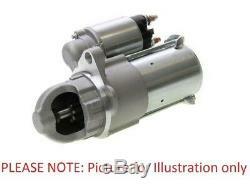 Genuine Bosch Engine Starting Starter Motor OE Quality Replacement For BMW. Please use the compatibility guide as a reference only. Please double check all information in the listing. Subscribe to our Newsletter for exclusive deals. Number of Thread Bores: 0. Rated Power [kW]: 1,7. The starter motor is a powerful electric motor that provides the initial impulse to turn over the engine to start it. It requires a very high current to crank the engine, which is why it is attached to the battery with large cables. When you turn the ignition key to the start position the battery voltage goes through a circuit to energise the starter motor. When the starter motor doesn't turn fast enough it is either a problem with the motor itself or the battery has run down. Items with this service available will be marked on the listing. DHL is a global company with one of the most recognised and admired brands in the world. PLEASE NOTE: All deliveries are made by courier and will require a signature. The courier will try and deliver the item twice before returning the item to us. Please ensure someone is present to sign for the item. Channel Islands All GY & JE Postcodes. Isle Of Man All IM Postcodes. Scottish Highlands All HS, IV, KW, KA, PA, PH & ZE Postcodes. Northern Ireland All BT Postcodes. We promise we'll do everything we can to ensure you receive your order within the time-frame specified. Occasionally events beyond our control may result in your parcel being delayed whilst it is with the courier and we cannot be held responsible for such delays. All parcels are fully insured and if your parcel is lost or delayed, let us know and we'll act quickly to locate it, bearing in mind the points below. All claims for missing items must be made within 28 days of the date of your order. Both of these couriers' offer an excellent service and we are very pleased to have them on board. Please note that we do not dispatch orders on weekends. Please return your item(s) in original packaging and ensure that all packages are securely wrapped. Upon receipt, all products will be inspected and at our discretion, credit may be refused. Any damages must be reported to us within 24 hours for us to raise any claims with our courier. Any claims after 24 hours will be dismissed for a claim. Certain products are treated specially for legal and/or health and safety reasons, It is important for your own and our couriers' safety that they are followed. As well as the above procedures the below must also be adhered to. Batteries must NOT be removed from the sealed bag. Failure to do so will result in the courier NOT collecting the product. Full details of our terms and conditions can be found here. Based on the manufacturers' opinion and further subject to clause 14.5 and 14.6, we will repair, (or at our sole option) replace such Goods with the same or superior Goods, without charge or not provide any of the aforementioned. Euro Car Parts Limited is a company registered in England and Wales (hereinafter referred to as "we", our or us). Maintaining the security of your data is of paramount importance to us and we are committed to respecting your privacy rights. How we use your data. What personal data we collect. Who we share your data with. How we ensure your privacy is maintained; and. Your rights relating to your personal data. Please read the following carefully to understand our views and practices regarding your personal data and how we will treat it. For the purpose of the General Data Protection Regulation (EU Regulation 2016/679, when applicable, the GDPR), and the EU Data Protection Directive (Directive 95/46/EC), the data controller is Euro Car Parts Limited of T2 Birch Coppice Business Park, Danny Morson Way, Dordon, Tamworth, England, B78 1SE. INFORMATION WE MAY COLLECT FROM YOU AND OTHER SOURCES. Although the precise details of the personal information collected will vary according to the specific purpose for which we are collecting the information, we may collect and process the following data about you. Information that you provide by filling in forms on our social media pages or on our website. This includes information provided at the time of registering to use our website, subscribing to our service, purchasing goods via our website or via our marketplace listings, posting material or requesting further services. We may also ask you for information when you report a problem with our website. Please note that we record and monitor telephone conversations that we have with you. The sole purpose of any recording is for training and quality control purposes. Under the GDPR any personal or confidential information disclosed shall not be made available to any third party (unless required by law to do so) or used for marketing purposes. Recorded conversations are deleted within three months after the recording was made. We may also ask you to complete surveys that we use for research purposes, although you do not have to respond to them. Details of your visits to our website including, but not limited to, traffic data, location data, weblogs and other communication data, whether this is required for our own billing purposes or otherwise and the resources that you access. We also collect behavioural and browsing data from you for the purposes of offering you a tailored or personalised online shopping experience. This is statistical data about our users' browsing actions and patterns, and does not identify any individual. We may also collect any personal information which you allow to be shared that is part of your public profile on a third party social network. We obtain certain personal information about you from sources outside our business which may include our group of companies (further defined below). For example, this other personal data helps us to. Provide the relevant services in an accurate manner. Review and improve the accuracy of the data we hold; and. Improve and measure the effectiveness of our marketing communications, including online advertising. USES MADE OF THE INFORMATION. We use information held about you in the following ways. To ensure that content from our website is presented in the most effective manner for you and for your computer. To provide you with information, products or services that you request from us or which we feel may interest you, where you have consented to be contacted for such purposes. To carry out our obligations arising from any contracts entered into between you and us. To allow you to participate in interactive features of our service, when you choose to do so. To enhance your experience whilst using our website. To notify you about changes to our service. If you are a new customer, we will only contact you by electronic means if you have consented to this. Whether you are a new or existing customer, if you have consented to being contacted electronically we will contact you in accordance with your consents. We may use your personal information to contact you if there are any urgent safety or product recall notices to communicate to you where we otherwise reasonably believe that the processing of your personal information will prevent or reduce any personal harm to you. It is in your vital interests for us to use your personal information in this way. Our website or marketplace listings may include links to third-party websites, plug-ins and applications. Clicking on those links or enabling those connections may allow third parties to collect or share data about you. To estimate our audience size and usage pattern. To store information about your preferences, and so allow us to customise our website according to your individual interests. To speed up your searches. To recognise you when you return to our website. However, if you select this setting you may be unable to access certain parts of our website. Any member of our group, which means our subsidiaries, our ultimate holding company and its subsidiaries, as defined in section 1159 of the UK Companies Act 2006. Our courier company who delivers your orders (such as DHL). Selected third parties if you are a new customer and you have consented to this. This generally occurs when our service providers are located outside of the EEA or you are based outside of the EEA. If this happens, we will ensure that the transfer will be compliant with the relevant data protections laws including the GDPR. Our standard practice is to use standard contractual clauses which have been approved by the European Commission for such transfers. Where standard contractual clauses are not used and your data is transferred to the United States, we will ensure that the service providers have signed up to the EU-US Privacy Shield which is a framework designed to protect the fundamental rights of anyone in the EU whose personal data is transferred to the United States for commercial purposes. HOW DO WE PROTECT YOUR DATA. We are committed to keeping your personal data safe and secure and employ a number of security measures such as. We ensure our website and data is supported with TLS1.2 technology using RSA 2048 bit security standard. Monitoring and auditing our service providers to ensure they have an adequate level of protection as required under the PCI DSS. All information you provide to us is stored on our secure servers. For registered users, where we have given you (or where you have chosen) a password which enables you to access certain parts of our website, you are responsible for keeping this password confidential. We ask you not to share a password with anyone. We use reasonable, organisational, technical and administrative measures to protect personal information under our control. Unfortunately, the transmission of information via the internet is not completely secure. Although we will do our best to protect your personal data, we cannot guarantee the security of your data transmitted to our website; any transmission is at your own risk. Once we have received your information, we will use strict procedures and security features to try to prevent unauthorised access. LEGAL BASIS FOR PROCESSING YOUR PERSONAL DATA. All other personal data is processed for our legitimate interests (as set out below) and to comply with our legal obligations. You have the right to withdraw your consent at any time. The normal legal basis for processing customer data, is that it is necessary for our legitimate interests including. Protecting customers, employees and other individuals and maintaining their safety, health and welfare. Promoting, marketing and advertising our products and services. Sending promotional communications which are relevant and tailored to individual customers. Understanding our customers behaviour, activities, preferences, and needs. Complying with our legal and regulatory obligations. Preventing, investigating and detecting crime, fraud or anti-social behaviour and prosecuting offenders, including working with law enforcement agencies. Protecting us and our employees and customers, by taking appropriate legal action against third parties who have committed criminal acts or are in breach of legal obligations to us. At any point while we are in possession of or processing your personal data, you, the data subject, have the following rights. Right of access you have the right to request a copy of the information that we hold about you. Right of rectification you have a right to correct data that we hold about you that is inaccurate or incomplete. Right to be forgotten in certain circumstances you can ask for the data we hold about you to be erased from our records. Right to restriction of processing where certain conditions apply to have a right to restrict the processing. Right of portability you have the right to have the data we hold about you transferred to another organisation. Right to object you have the right to object to certain types of processing such as direct marketing. Right to object to automated processing, including profiling you also have the right not to be subject to the legal effects of automated processing or profiling. Right to judicial review: in the event that we refuse your request under rights of access, we will provide you with a reason as to why. You have the right to complain as outlined below in the "Contact" section. All of the above requests will be forwarded on should there be a third party involved in the processing of your personal data. You can also exercise the right at any time by contacting us at Euro Car Parts Limited by any of the means outlined below. Our website may, from time to time, contain links to and from the websites of our partner networks, advertisers and affiliates. If you follow a link to any of these websites, please note that these websites have their own privacy policies and that we do not accept any responsibility or liability for these policies. Please check these policies before you submit any personal data to these websites. HOW LONG DO WE KEEP YOUR DATA? We will only retain your personal data for as long as necessary to fulfil the purposes we collected it for, including for the purposes of satisfying any legal, accounting, or reporting requirements. Data back-ups can take up to 60 days to remove specific data from the system. We will take reasonable steps under Article 17 of the GDPR to meet data subject requests. CHANGES TO OUR PRIVACY NOTICE. Write to use at: Euro Car Parts Limited, Legal Department, T2 Birch Coppice Business Park, Danny Morson Way, Dordon, Tamworth, England, B78 1SE. Issue Date: 14 June 2018. We aim to reply to all messages within 24 hours. Euro Car Parts Limited T2 Birch Coppice Business Park Danny Morson Way Dordon Tamworth B78 1SE. The item "Genuine Bosch Engine Starting Starter Motor OE Quality Replacement For BMW" is in sale since Wednesday, January 24, 2018. This item is in the category "Vehicle Parts & Accessories\Car Parts\Electrical Components\Starter Motors". The seller is "eurocarparts" and is located in United Kingdom. This item can be shipped to North, South, or Latin America, all countries in Europe, all countries in continental Asia, Australia.